For starters, let me say that you are not going to read anything here that’s surprising or new. That the title of this post claims this is perfect is part marketing, part hyperbole and all the results of user-testing in my household; from visiting guests to permanent residents. Over and over again it meets with 100% satisfaction as evidenced by the clean plates of all those who it is served to, including the crust. Like coffee, something made with so few ingredients must be made with the best version of those ingredients. You may have in your house better versions then what I use, but I suggest you use what you regularly buy and have in the house. Otherwise, you’re not really satisfying the tenets of “Low Arts.” Going out buying stuff for special is really more chef than short-order cook. (The really ambitious and health-concious could make the bread using the great recipe of “Almost No Knead Bread” and make your own cheese and butter. But I’m not set up for that). I used Wholesome Valley Organic American Cheese, Whole Foods Enriched White Bread and Kate’s Salted Butter (natch). Assemble the sandwich separately: take two slices of bread and lay them next to each other. 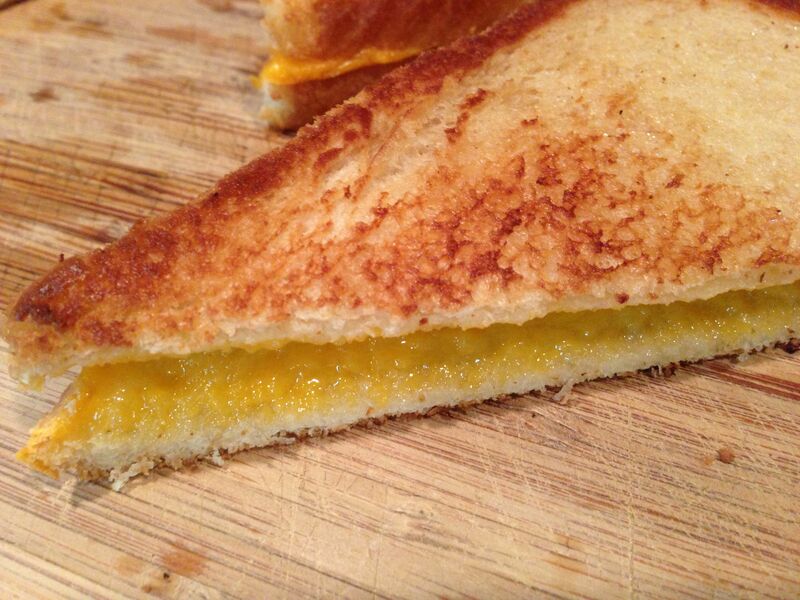 Cover one slice of bread with American cheese. I find in most cases this requires at least two slices of cheese. I generally don’t overlap them. Rip and puzzle-piece them together. Place the other slice of bread on top. Place the pan on a medium heat. Turn your toaster oven on its highest toast setting and push ‘start’, ‘toast’ or whatever button begins the heating process. I know, nothing’s in it. You’re doing this so you can put the grilled cheese into a warm oven and wait less time for the cheese to melt. Add butter to the pan, melt, but don’t let it burn. Place the whole sandwich in the circle of melted butter. Press down with your hand or spatula. I like to move it around the pan to get it well-coated. Carefully lift up the sandwich, add more butter and melt. Place the sandwich back in the pan, and press down. When both sides of the sandwich are well-browned, remove the sandwich from the pan and put it in the toaster oven, on the grates, unless you fear a cheese-melt fire. If the toaster cycle has ended, start it again; I find it takes about two minutes for complete top-browning and side-cheese melting to occur. Remove from toaster and set on wooden cutting board on cookie cooling rack; putting it on a plate will invite condensation. Wait five minutes. So I have experimented and rejected a lot of different ways to do this differently. A lot of people suggest buttering the bread first; I have found that this is extra work that does not significantly improve the outcome. There are also people who suggest ways to get the cheese melty in the pan or use the microwave; those don’t work for me. I personally like adding bacon, ham or any pork product, but it did not test well with kids. Posted in Food Writing & Other Stuff, Meals and tagged American Cheese, Grilled Cheese, ingredients on June 1, 2014 by Robert Deutsch.